Wheat is an ideal food item suggested for diabetic patients since it is rich in fibre. Usually when we think of wheat food varieties, Roti is the first name comes into our mind. Instant wheat dosa (Goduma dosa) is a very easy to make and one of the jiffy cooking recipes. No need for soaking and fermenting. 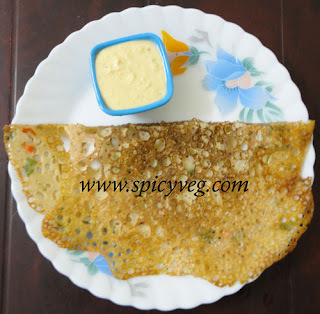 Wheat dosa can be eaten as a breakfast or anytime when hunger strikes. This dosa is also known as ‘Godhuma Dosa’. 1. Take wheat flour in a bowl and add water, mixing, so as to prepare a lump free, smooth batter. Batter consistency should be like dosa batter not too thick and not too thin . 2.Add rest of the ingredients except oil to the wheat batter and mix well. Set aside for 15 minutes. 4.Heat a non-stick tava (griddle) and for the 1st dosa smear the tava with oil and wipe off the excess oil with a paper napkin. 5.Turn the heat to medium and spread a ladle full of batter in an outward, circular motion (dosa should be cooked on medium heat). 5. Drizzle oil on it. When the edges look brownish from underneath, remove the dosa from the tava gently and then cook from the other side also. When dosa look brownish from both sides, remove the dosa from the tava. 6.Similarly make rest of the wheat dosas from the remaining batter and serve with the chutney of your choice.